As Birnbaum explains it, the new natural language generation software has been made possible – or rather, necessary – by the advent of Big Data. The prior limitations on the topics software programs could write about are disappearing, as all realms of human activity become subject to data processing. Joe Fassler notes in The Atlantic that “the underlying logic that drives [algorithmic writing] – scan a data set, detect significance, and tell a story based on facts – is powerful and vastly applicable. Wherever there is data . . . software can generate a prose analysis that’s robust, reliable, and readable.” Hence, automated journalism will continue to expand into less obviously data-driven realms of reporting as new sources of data become available for processing. Meanwhile, the Associated Press and Forbes, to name a few, are already publishing thousands of software-written articles. Business and technology reporters were the first to cover the new startups shortly after their appearance, and technology critics soon followed up with articles attempting to gauge the implications of robo-writing. Self-appointed scourge of Silicon Valley Evgeny Morozov was onto the story back in 2012 with a Slate essay entitled “A Robot Stole My Pulitzer!”; Google-booster Steven Levy published an enthusiastic profile of Narrative Science at Wired a few weeks later. It did not take long for journalists to start publishing their anxious reflections on yet another trend destined to deprive them of their jobs. And unlike, say, the decline of advertising revenue, this is not a contingent threat but one that strikes at the core of what writers do, converting their hard-acquired skills into instant formulas. Nevertheless, most published responses to algorithmic text generation, whether critical, anxious, or enthusiastic, present writing as only one technological activity among many for which the direct intervention of a human operator seems to be becoming obsolete. Once this assumption is granted, the discussion becomes subsumed into existing debates about automation: can computers do everything humans can do, or are there limits? Who will lose their jobs? What adverse social consequences might result? By most accounts, then, the automation of writing differs from the automation of aviation or medical diagnosis in the details, but not in its essence. Yet historically and culturally, writing is not one human activity among many, but one with a uniquely ambivalent place in the history of ideas about technology. Podolny, writing in the New York Times, relies upon the longstanding view of writing as a uniquely human capacity when she asserts that the new algorithmic writing forces us ask: “What does ‘human’ even mean?” But she does not acknowledge that writing has long had the paradoxical status of being regarded both as a manifestation of inalienable human attributes, and as a technological prosthesis radically alien to, and separable from, the human person. This paradoxical status has occasioned a series of famous intellectual scandals, of which Plato’s critique of writing in the dialogue Phaedrus is the locus classicus. For Podolny, computerized writing forces us to reconsider the definition of the human; for Plato, it was writing itself that threatened to undermine the human subject of knowledge by outsourcing its most fundamental attribute – what he describes as “the living, breathing discourse of the man who knows” – to an uncanny simulacrum that “you’d think was speaking” yet remains “solemnly silent.” Fassler, writing in the Atlantic, finds the “eerily humanlike cadence” of Narrative Science’s products unsettling; Plato noted a similar eeriness in the way in which written texts mimic the flow of live human speech, yet stand at a disembodied remove from their origin. French philosopher Jacques Derrida’s project of “grammatology” traced the continuation of Plato’s polemic against the subversive power of writing throughout Western philosophy and literature. Western metaphysics, Derrida claims, has been constitutively phonocentric, locating truth and authenticity in the voice and regarding the written word as a degraded, mindless simulacrum of speech. While one hears echoes of Plato in recent articles that describe the “humanlike” qualities of algorithmically generated texts as “eerie” or “creepy,” what is lost is a sense that writing was already, for millennia, a distressing site of the technological uncanny. Precisely because of writing’s status as a decentering, destabilizing supplement to human subjectivity, the post-structuralist thinkers of the heroic age of literary theory took the declaration of the autonomy of writing as the starting point for a dismantling of the modern bourgeois myth of Man. Hence we find Roland Barthes, in his polemical essay “The Death of the Author,” affirming precisely what Plato feared: “writing is the destruction of every voice, of every point of origin. Writing is that neutral, composite, oblique space where the subject slips away, the negative where all identity is lost, starting with the very identity of the body writing.” He goes on: “to write is, through a prerequisite impersonality . . . to reach that point where only language acts, ‘performs,’ and not ‘me’.” For Barthes and his successors, writing already forces the radical questioning of human essence that recent observers have linked to the impact of algorithmic text generation. Yet as media theorist Friedrich Kittler has argued, technological shifts in the practice of writing helped make the theoretical revolution declared by Barthes more plausible. In Kittler’s account, the early modern Europe dominated by alphabetic literacy – what Marshall McLuhan called the Gutenberg Galaxy – accorded to the handwritten word much of the metaphysical prestige reserved by Plato for the voice. For centuries, handwritten script was the visible trace of the soul, its “energetic and ideally uninterrupted flow” validating the presence and wholeness of a self: “the alphabetized individual had his ‘appearance and externality’ in this continuous flow of ink or letters.” For Kittler, the self-confident individual, who emerged out of the Enlightenment endowed with a rich sense of “interiority” (Innerlichkeit), found substantiation in script, which accorded to the ineffable self a material being communicable to the outer world by means of the hand. Kriss’s parodic theology of writing echoes the theological terms of the polemic on writing that began with Plato. For Barthes, as for Derrida and for the surrealists who pioneered automatic writing as an avant-garde practice, the death of the author was closely linked to the Nietzschean “death of God”: the liberation of writing from the conscious human subject was also, as Barthes proclaimed, a liberation from the understanding of the text as “a line of words releasing a single ‘theological’ meaning (the message of the Author-God).” It is surprising, then, that while algorithmic writing seems to demote what Kriss calls the “sense-making function of language” to a vanishingly insignificant role, NLG software’s creators and promoters account for its impact in terms that suggest the exact opposite. Here, for example, is Narrative Science’s description of Quill: “Every data-set, every database, every spreadsheet has a story to tell . . . Our advanced NLG platform, Quill, analyzes data from disparate sources, understands what is important to the end user and then automatically generates perfectly written narratives to convey meaning from the data for any audience, at unlimited scale.” It goes on: “There is a clear and immediate opportunity to bridge the gap between data and the people who need to understand it. That bridge is the power of a story. A story explains data, making it more understandable, meaningful and actionable.” Automated Insights’s slogan is in the same spirit: “Let your data tell its story.” “A line of words releasing a single ‘theological’ meaning” would appear to be precisely the product on offer. 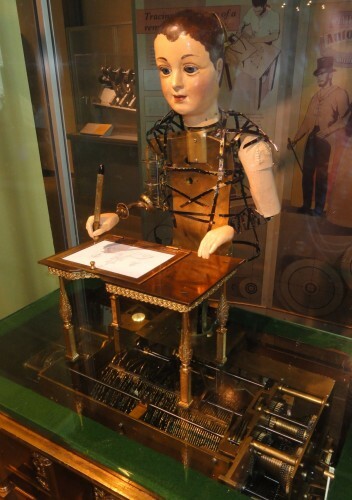 We must keep in mind, however, that the possible implications of available technologies of writing are one thing, while the dominant ideological construction of those technologies is another. For Plato, handwritten script threatened to undermine the self-contained autonomy of human consciousness, yet within the ideological framework of the Gutenberg Galaxy, as Kittler reveals, handwritten script was an essential attribute of human consciousness. The same technology that once seemed to threaten human essence ultimately came to ratify it; what Derrida called “logocentrism” can equally repudiate writing or fetishize it. It is therefore not inconsistent with Kriss’s conclusions that the developers of NLG software explain its significance in terms that suggest not the final eclipse of the “Author-God,” but the emergence of a new theology of writing and a new ideology of authorship, the creation of mechanisms to fix and constrain meaning, and the reinforcement of the reader’s passive status as receiver of that meaning. Such paradoxes, as this brief account has suggested, haunt the history of ideas about writing from the outset. Algorithmic writing, then, is not only writing untethered from the Author-God of old, but also writing in the service of the alleged neutrality and omniscience of Big Data. In this sense it does indeed, to borrow Kittler’s phrase, “communicate a beyond.” This “beyond” is not the ineffable interiority of the “Author-God,” but what Will Davies has called the “Data Sublime”: expanding realm of digital information that produces awe and exceeds human comprehension through its sheer vastness and the forbidding opacity of its zeros and ones. Algorithmically generated text is the handwriting of this new God and a locus of His revealed Word. Its architects are not Kabbalistic theologians, but positivistic Protestant ones: for them, language is, or should be, a pellucid medium of unambiguous, univalent facts, optimized and customized for the “end user’s’’ maximally efficient access. Claude Lévi-Strauss, another key figure in the intellectual history of the scandal of writing, asserted that the emergence and spread of alphabetic writing “seems to have favored the exploitation of human beings rather than their enlightenment.” The real question raised by algorithmic writing is not, as some observers have claimed, what “the human” now means, but what new God or gods we are being asked to serve. Geoff Shullenberger teaches in the Expository Writing Program at New York University, and sometimes tweets at @daily_barbarian.